If you really like theater, there are few experiences as cool as standing off stage in the wings during a curtain call. If that moment marks the end of a limited run of a production that has clearly energized the theater, it becomes all the more remarkable. That is what I was lucky enough to witness on July 2 of this year at the San Francisco Opera. 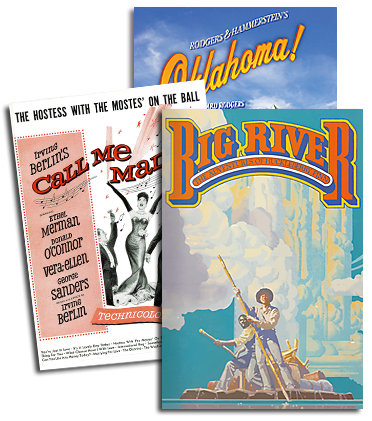 The production was SHOW BOAT, done as a joint production among four American opera companies. Performances took place over a four year period at Lyric Opera of Chicago, Houston Grand Opera, Washington Opera, and San Francisco Opera. While there may be other stops in the future, San Francisco was the last one of the initial dates. It was director and impresario Francesca Zambello who conceived the production, and it was in her apartment many years ago that I first talked about it with her and Bill Mason, at the time the General Director of Lyric Opera of Chicago. David Gockley, General Director at San Francisco, has a history with SHOW BOAT. When he was at Houston Grand Opera in the 1980's, he created a SHOW BOAT that made its way to Broadway, where it played the Gershwin Theater. Not only is he a fan, but as an enlightened American opera intendant, he is very smart about the intersection of opera and musical theater. His note in the program was extremely well stated - about how Broadway today cannot support the resources needed to present pieces from the era of SHOW BOAT, and how several of the members of the company might have spent more of their careers in musicals in another era. He stated that opera companies should welcome the few titles that 'cross over' successfully, and give them the full treatment. David was very smart about what would be playing in his theater. Having seen the production in its previous stops, and knowing he wanted to capture it on film, he wanted to be very careful in casting. From the beginning he had Heidi Stober and Patricia Racette, both known to his opera audiences, as Magnolia and Julie. Michael Todd Simpson had filled in during the Washington Opera run last year, and proved to be a dashing Ravenal. 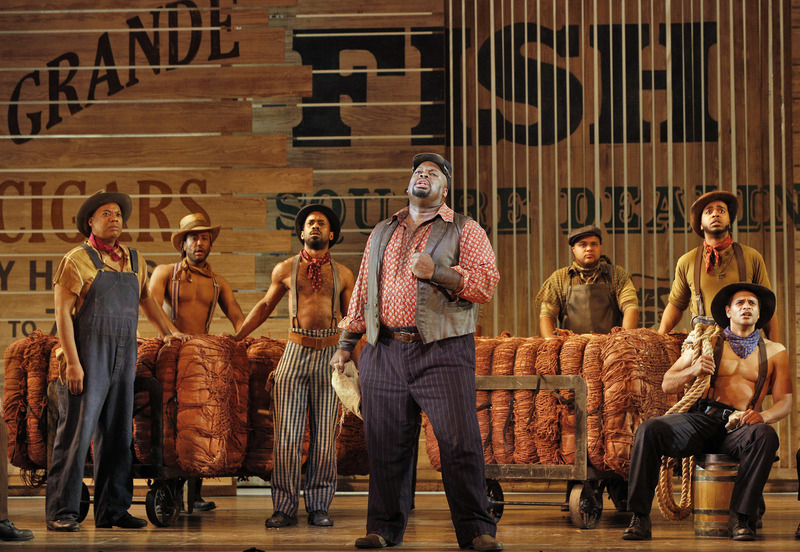 Morris Robertson and Angela Renee Simpson, both with fine opera credits, played Joe and Queenie. But for the more 'musical theater' roles, he sought the assistance of ace Broadway casting director Bernie Telsey to find an amazing group: fresh from Rodgers + Hammerstein's CINDERELLA came Harriet Harris, as funny a Parthy as there ever was. (I swear she found laughs where there weren't any...) For Frank and Ellie, the song and dance team who are perennially somewhere between trying too hard and constantly being overlooked, John Bolton and Kirsten Wyatt, both so wonderful in A CHRISTMAS STORY, struck the perfect posture. And in a brilliant piece of casting, Captain Andy was played by rubber-legged Bill Irwin, as capable of cracking a joke as giving Charlie Chaplin a run for him money in the world of the wobble-walk. Back to the curtain call. I had been told that the show was doing sellout business, that they tried but failed to add performances to the schedule. Hey, the day after the final two back to back performances of SHOW BOAT, Patricia Racette would perform in MADAM BUTTERFLY at the house - no wonder they couldn't just add a couple of performances! Clearly this was a company that enjoyed performing SHOW BOAT, and had bonded. Watching them take their bows, and hearing the audience from a slightly ajar position, you could see how much the company cared for each other. When the cheering finally stopped - after many group walks downstage hand-in-hand - and the front drop was brought in, the principles started to hug one another while the choristers from upstage came dashing down to embrace their leaders. Tears - OK, this is the opera world and tears are sometimes just part of the drill - were quite literally streaming down faces. Heidi Stober, portraying her first musical theater role, was awash, hugging David Gockley and thanking him so much for the opportunity. Jerome Kern and Oscar Hammerstein II would have felt sitting in the War Memorial Opera House on the night of July 2, 2014. I think they would have been pleased. It was, after all, 87 years ago that their SHOW BOAT first saw the light of day. Old Man River does indeed keep rolling along!